Can I use my Scholastic Rewards to purchase We Are Writers books? Scholastic Rewards cannot be used to buy We Are Writers books, but you can earn Rewards on any books sold. You can use school funds to make your purchases and can be invoiced separately for We Are Writers books if you wish. How can We Are Writers benefit my Book Fair? A We Are Writers book can add a real buzz to your Fair – and displaying your final book at a Fair will also help to increase the number of people who order a copy. You will earn Scholastic Rewards on any books that you sell at your Fair. Before you start, make sure you will have enough time to complete the book in time for your Fair delivery date. When you set up your book, select the date of your Fair as the sample delivery date by selecting the circle next to your Fair date. Place your final order only when you have advertised your book at your Fair and collected all of your orders. We recommend that you do not pre-order your books in the hope of selling them as you will be liable for the cost of all books, sold or unsold. To ensure that you earn the maximum number of Scholastic Rewards on your book sales, please place your final order before you fill in your online Cash Report Form. All takings from the sales of We Are Writers books and from the Book Fair must be paid at the same time. Call us on 1800 272 321 or email bookfairs@scholastic.ie to find out more. How long does it take to produce a We Are Writers book? We recommend that you do not start a book less than 15 weeks before the end of the school year, so that you have plenty of time to distribute copies of the book to pupils who are moving on. 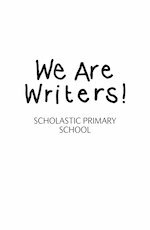 We Are Writers books are priced at €8.00 each, and you will earn up Scholastic Rewards on every book sold. We require a minimum order of 50 books. 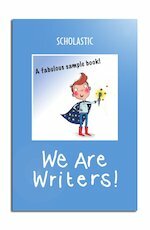 There is no charge for setting up a We Are Writers book or ordering a sample copy. Once you have set up the book, you’ll need to give the children the book password. They will then be able to log on using the large ‘Children’s login’ button at http://writers.scholastic.ie. No. Although you can add a picture to the cover of your book, you cannot add images to the inside pages. You can invite colleagues to help from the Overview page. In the top right of the screen, click on the link ‘Invite colleagues to help with your book’. 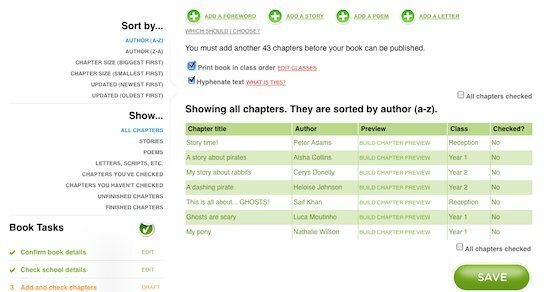 This will allow helpers to access the We Are Writers book and share the workload. Don’t worry if you run out of time: you can simply choose to sell your Writers book after your Book Fair. In order to receive Scholastic Rewards for your book though, you must place your final order before filing the Cash Report for your Fair. If you are worried about timings, give us a call on 1800 272 321 or email bookfairs@scholastic.ie. To achieve this you need to add the ~ symbol (called a ‘tilde’, which can be found by pressing SHIFT and the # key) before each word you’d like to move down a line instead of a space. 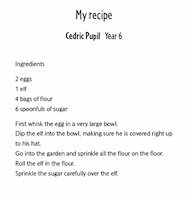 So in the School name field in Step 2, School Details, type St Brigid’s~National School in and it will appear as in the second example above. 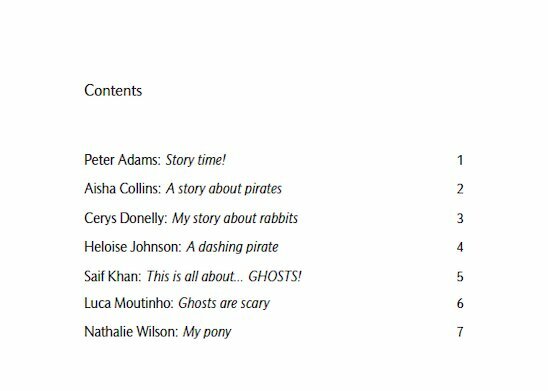 Alternatively you can select point 7 in the timeline, ‘Check my book’, which can be found in the menu on the left side of the screen. PDF stands for Portable Document Format. To view PDF files you will need to download some free Acrobat Reader software from www.adobe.com. You will receive one sample copy approximately 14 working days after you place your first order. You should make sure that any order is placed at least 15 working days before school holidays so that there is no chance of the school being closed when your parcel arrives. Yes, you can order more copies but you must place a minimum order of 30 copies. If you wish to reorder, please call us on 1800 272 321 and this can be arranged separately. 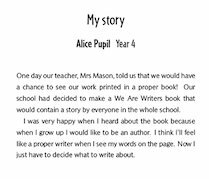 Julia Donaldson, author of The Gruffalo, has provided an inspiring introduction that will feature in all We Are Writers books until end-July 2013. Read it here. 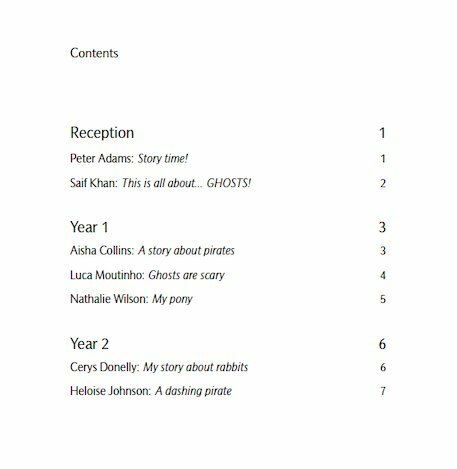 There are more free resources to choose from including more story starters and a certificate that can be presented to newly-published authors alongside the finished books. Customers should also be aware that the minimum order is 50 copies, the maximum page extent is 740 pages and the price is €8.00 per book. What should I put on my promotional poster? Once you have uploaded a cover image, a preview of your cover will be used to generate a promotional poster for you to display around the school. You can add five short lines of information text to the poster too. We will send you five free copies of the poster when you order your sample book. On sale from 1st-5th November. 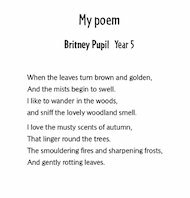 Contains work by every child in the school. Sample copy on display at our Book Fair. A snip at only €8.00. Just call our friendly customer services team on 1800 272 321. Lines are open Monday to Friday between 9.00am and 5.00pm. You can also email bookfairs@scholastic.ie. Can I use World Book Day €1.50 vouchers on We Are Writers books at my Scholastic Book Fair? Yes. If you are running We Are Writers with your Scholastic Book Fair, children are permitted to use the €1.50 World Book Day vouchers on purchases. There is a limit of one voucher per book and all vouchers must be valid. If in any doubt, please call Customer Services on 1800 272 321 or email bookfairs@scholastic.ie.